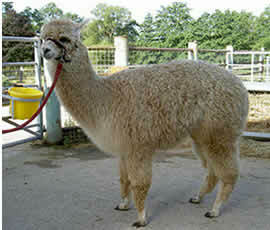 Alpacas are the most colour diverse, fibre producing animals in the world. There are five main colours, which can be sub-divided into 22 natural shades. Alpaca fibre is stronger than wool, and second only in strength to silk. Its fineness is measured in microns and in the most fine fleeced alpacas (currently) can be as fine as cashmere. Alpaca fibre is free from lanolin, which makes it popular with hand spinners, and also easy to process commercially. Fine alpaca fibre measuring in the low 20 micron range, produces luxurious garments – which are warm and can also be lightweight. These can be made in the full variety of natural colours – or can readily be dyed using either natural or synthetic coloured dyes. Although alpacas have been present in the UK for many years, the total volume of fleece produced remains too small to support the type of commercial processing industry we see for lambswool. 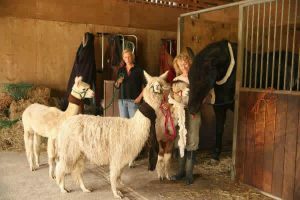 However, numbers of alpacas are growing annually, and with the proliferation of mini-mills and other co-operative ventures, the future for fibre processing looks increasingly bright. 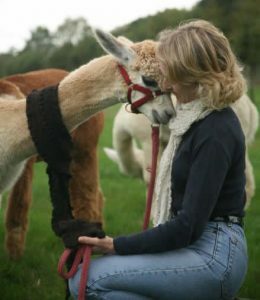 In addition, companies such as UK Alpaca, buy alpaca fibre to process, which is then sold as top quality yarn. We are also in touch with a number of small local spinning and weaving guild members, and can arrange to have small quantities of fibre processed. 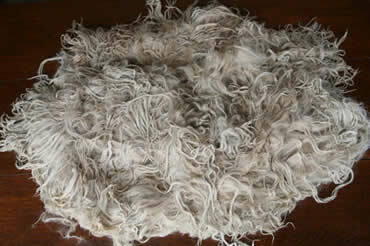 Alpaca fibre falls into the two alpaca breed types: Huacaya and Suri. Huacaya alpacas are shorn annually. 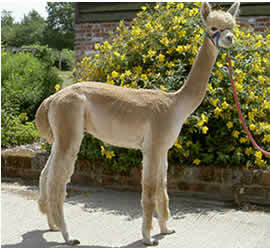 Suri alpacas are typically shorn every two years. 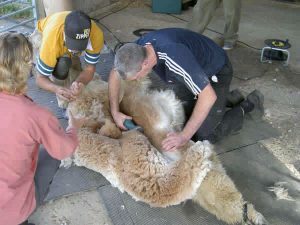 For an annual clip, breeders should be expecting 2.5 – 5 kilos of fleece for total adult fleece weights. The fleece should be bright, healthy, and reflect the general wellbeing of your alpacas. The absence of stronger fibre (or guard hair) is desirable. This is particularly the case in the saddle area (prime fibre), which is the most valuable for processing. Our aim should be to breed for fineness, softness of handle,density and cutting weight, all combined in a bright/lustrous and healthy fleece. In addition, in huacaya, we are looking for crimp. In suri’s, we are looking at the uniformity and style of lock structure. In order to achieve this, it is important to choose the best stud male for our females. This can of course depend on our goals within our breeding programme. For the industry in general, it is desirable over time to improve the quality of our national herd. 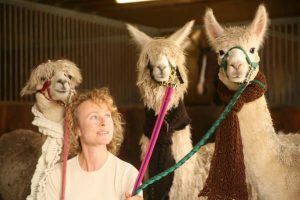 This is so that British alpaca fibre can compete increasingly effectively alongside some of the more developed fibre markets. On a fun note, we thought it might be interesting to see what our Alpacas thought about “wearing alpaca” (and one of our liveries!). Whatever they thought, they didn’t seem to mind! Here are some initial examples of both huacaya & suri fleece that we have had hand spun & have made into scarves.